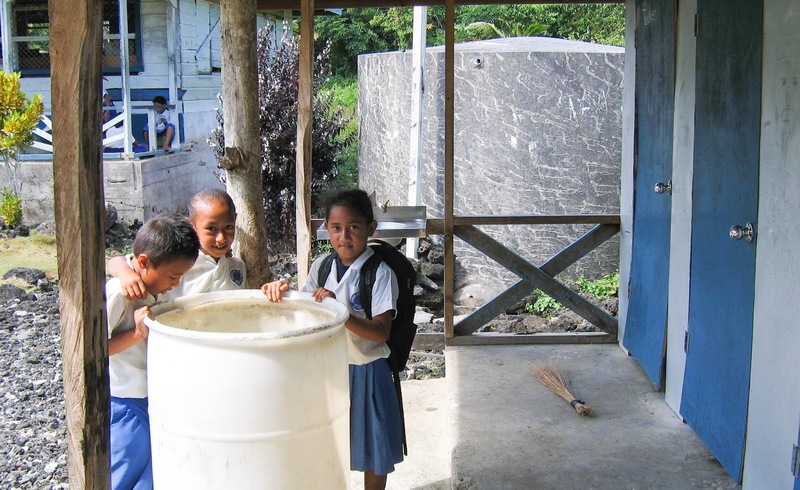 Rotary success stories - New Zealand and SW Pacific: I know I how to wash my hands but there is no water! I know I how to wash my hands but there is no water! My Rotary Moment occurred during a trip to Samoa in May 2008. I was invited there because of my Civil Engineering background, to assist the Rotary Club of Auckland Harbourside (a club with which my Rotary Club of St Johns has close ties, as both clubs are in District 9920) in scoping a water supply project they were sponsoring. The village of Falelima situated on the island of Savai’í happens to be located on a very porous layer of volcanic lava, so the natural rainwater runoff, unlike in other villages on the island, soaks in above the village and runs underground to the sea. The village therefore relies on water collected from roof areas by gutters and connected tanks. The problem was that much of the guttering in place was inadequate - there was not enough of it to provide the required amount of water to tide over the dry season, and many of the tanks were small and leaking. Also many of the roofs were difficult to attach gutters to because of a lack of facia boards. The villagers lacked the skills and resources to improve the situation, so were forced to import expensive tanker supplies each dry season. The trip I went on was the first to the village and had the objective of scoping the work required, particularly at the village primary school which has a large roof area and adequate facia boards, but lacked much of the possible guttering and tank capacity required. My Rotary Moment occurred when I observed a young girl no more than 7 or 8 years-old come out of a toilet, turn on the tap at the hand basin, and despite the fact that there was no water coming out, go through the actions of washing her hands! I then suddenly realised what District 9920 was all about and the wisdom of Rotary as an organisation tying in the Pacific Island countries with New Zealand districts. On a subsequent trip, Auckland Harbourside Rotary with some financial assistance from other clubs, including my own, were able to complete guttering on the school, provide additional tank capacity, repair the existing leaking tanks and also improve other amenities at the same time. In addition, guttering was added to the village church which had an existing large tank and throughout the exercise the locals villagers learnt to construct guttering and repair the other tanks in the village.